In case you don’t have an extremely busy week of shopping, holiday parties, and watching Love Actually, here’s a short list of six Chicago-ish things to do this week. Criticizing Caleb Hanie not included. Zoo Lights at the Lincoln Park Zoo. Not pictured: light-up animals. 1. Live Holiday Music at the Hideout featuring Scott Lucas & the Married Men and Purple Apple: This is the second annual Hideout Holiday Music Hour (note — it’ll probably last more than an hour) featuring Scott Lucas & the Married Men, a show that mimics an old-time radio show (for younger readers, that means the kind of show Bob Hope would have done, and not Dr. Drew). The show will feature plenty of well-known holiday songs, and since Scott Lucas is one half of Chicago group Local H, there will be absolutely no California songs. A portion of the proceeds will benefit National Association for Down Syndrome. Tickets $8 and available online or at the Hideout box office. 2. Piece Christmas Carole Karaoke: You’ve been whistling Christmas songs for the last two weeks. So perhaps it’s time to belt out a full song. If the movie Elf taught us one thing, it’s that “the best way to spread Christmas cheer is singing aloud for all to hear.” And if you’re tentative, throw back a couple of Piece’s Dark & Curvy dunkelweizens — one of our personal favorites. The pizza is pretty good too. $5 donation per song, 10% of all proceeds go to PAWS. 3. Drink Christmas Ale (on tap!) at Small Bar in Logan Square: Christmas Ale, made by Cleveland’s Great Lake’s Brewery, may sound like a festive beer. But its 7.5-percent alcohol-by-volume will not produce any Christmas miracles, unless it gets you to finally ask someone to be your New Year’s Eve date. Christmas Ale, along with many other seasonal brews, will be served at Small Bar’s upcoming Holiday Big Beer Tasting. 4. Watch the Bears (or another NFL team) and the Bulls at Finley Dunnes on Christmas: Finley Dunnes doesn’t open on Christmas Day until 3 PM, about five hours too late for some people. If you’re “bar family” is the family that doesn’t annoy you, then sneak away from your blood relatives to get more eggnog around 2:30, head to Finley Dunnes for an orange whip and free popcorn, and don’t come home until about 11 PM. Yes, you’ll be in trouble with your actual family, but you’ll also survive Christmas with your sanity. 5. Go to the Rainbo Club to see Occupy North Pole display: Chicago musician and author Tim Kinsella created the fantastic assisted in the creation of the “Occupy the North Pole” window display at the Rainbo Club. It features Santa, unionized elves, Godzilla, Jesus, robots… honestly, it’s possibly the greatest Christmas window display of all time. See photos of it at Tim Kinsella’s website. Or just go to the Rainbo to check it out in person. Rainbo Club * 1150 N. Damen Ave. * Ukrainian Village. 6. 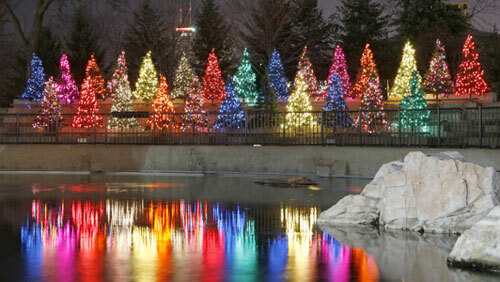 Lincoln Park Zoo Lights: Seriously, just do it. It’s completely free.